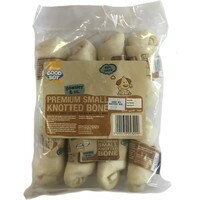 Good Boy Pawsley Premium Small Knotted Bones is a bag of tasty chews that will have your dog begging for more. Made from high quality rawhide, these delicious treats are the perfect reward for your pooch after good behaviour. These hard chews become soft whilst chewing helping to remove plaque and tartar build up, while giving a good jaw workout, fantastic for helping to maintain good oral hygiene!